A mini-games collection based on that Amercian TV show thingie of the same name, probably one of the dumbest things ever to hit the TV screen. The game was developed by Imagitec Design, designers of such popular games as The Humans series. As I really hate all those TV show sports like Show Wrestling and this Gladiator stuff, I won't comment anymore on that. But the computer game is actually not that terrible after all. Probably because those grown-up guys and gals from the show are now just a collection of computer pixels. 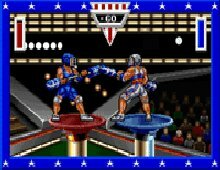 Not great, but as the various events are very unusual for computer games, American Gladiators is okay for a change. Probably a must-have for fans of the TV show, and worth a look to everyone else.